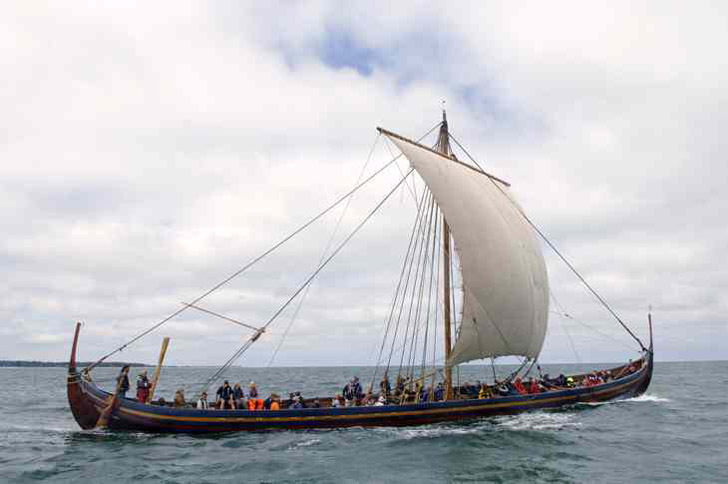 The Viking ship The Sea Stallion is now close to the end of the voyage from Ireland waiting just outside Roskilde to enter the harbour at the 9th of August. A big Viking market near the Viking Ships Museums is waiting and on top of that concerts and other events in the town of Roskilde. Another celebration took place the Viking Ships Museum today when the Danish National Bank presented a new coin showing the Sea Stallion on one side and Queen Margrethe II of Denmark at the other. The Sea Stallion has been a model before. In 2004 the ship showed up on postal stamps in a series of Viking stamps which also included the Jelling Stone. The coin with the Sea Stallion is part of a series of "thematic coins" presented by the National Bank in the last few years. The Sea Stallion is number 4 in a series of coins with ships. Earlier also the World's largest wooden ship the Frigate Jylland has had its own coin. The coins have a value of 20 kroner - equivalent to 2,68 Euro. Although member of the EU Denmark's money are still Kroner and not Euro, which make it possible for the National Bank to decide special coins as this one with the Sea Stallion. In the series of coins with ships the National Bank previously presented a coin with the Diesel ship Selandia - build in Copenhagen and for many years the ship with the largest diesel engine in the World. Other series of thematic coins has included a series of Danish towers - also 20 kroner - and a series of "Polar Coins" which included a 1000 kroner coin made of pure gold from Greenland.